Consider how physically active you are and how much time you are at home and available to play with a dog. While we can all picture ourselves spending our days playing frisbee in the park with our new pet pal and taking them with us on long hikes on the weekends it is important to be realistic. Getting a dog that requires a large amount of exercise and activity if you spend long hours at the office and then enjoy movie marathons all weekend will end up being frustrating for all involved. Do your research and find a breed that will be most compatible with your real lifestyle… not the one you wish you had. Consider if your dog will live with or regularly be around kids. Adding a dog to your family should be a lifetime commitment. Identify beforehand if it is important to you to have a dog that will be very kid friendly. 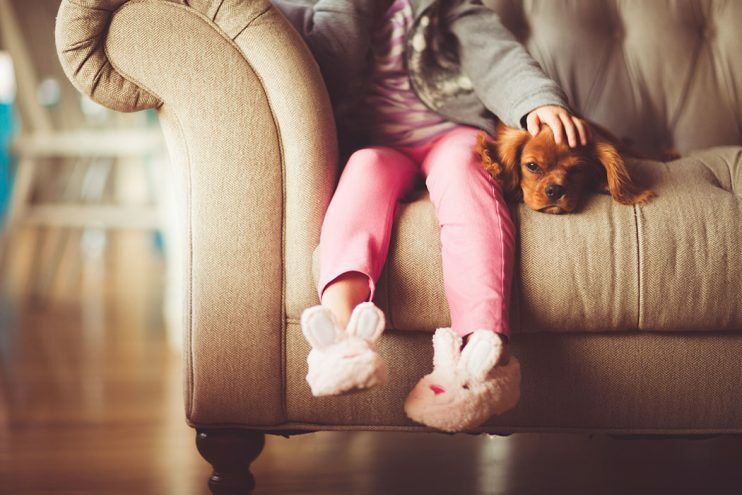 While it is true that almost all dogs can learn to behave well with children, especially when exposed to them regularly from a young age, some breeds are just more kid friendly than others. If adopting an older dog take your kids with you to spend time with dogs you are considering and always ask about past abuse or issues. Count the cost. In general adopting a dog from a shelter or the humane society is often a cost effective way to go. When you adopt a dog they are usually up to date on their vaccinations and have usually already been spayed or neutered. But, owning a pet still requires a financial commitment. Make sure there is room in your budget for veterinary appointments, vaccinations, flea and heartworm medications and a pet sitter or boarding when you are out of town. Some breeds also require grooming on a regular basis so this also needs to be taken into consideration. Consider what role in your life you are looking for your dog to have. Just like it is important to be realistic about your lifestyle it is important to be realistic about your expectations of your new dog. Are you looking for a guard dog? A hunting companion? A running partner? A snuggle buddy on the couch? Consider what role you want your dog to play in your life and then consider what breeds might be the best fit. Consider the laws, rules and regulations where you live. This might sound obvious, but in the excitement of adding a new pet to your family it can be easy to overlook the details. If you rent where you live it is very important to talk to your landlord and learn exactly what the rules are when it comes to pets. If you own, some neighborhoods and cities have regulations on how many pets you can have. It is important to know the rules before you purchase a new dog and have committed to its care. If you still aren’t sure which dog is for you follow this link to take a quiz and determine what dog might be the best fit for you and your family. And after you have brought your new friend home please contact us at Pet Stop St. Louis and we can help you keep your pet safe.